In need of the best rated Corpus Christi, TX lawn service? Lawn Love is your lawn service near me answer. Lawn Love makes it easier than ever before to find lawn care services in Corpus Christi by bringing the lawn services industry into the 21st century. Get an instant quote for lawn care services near Corpus Christi such as lawn aeration, lawn mowing, leaf removal, gutter cleaning, gardening, yard care, weed control and more. 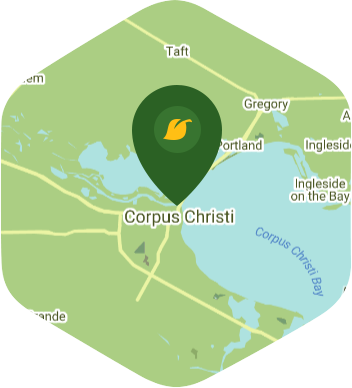 See why we're rated the #1 Corpus Christi lawn service company. If you've ever said I need affordable lawn care services near me with a push of a button then Lawn Love is the answer to all your lawn service prayers. The sunny, breezy vibe of Corpus Christi suits your lifestyle perfectly. And its great education system, delectable restaurants, wealth of social activities, and beautiful scenic views make it easy to call Corpus Christi home. Speaking of home and scenic views, however, your lawn might not be as scenic as you'd like. You know it needs a lot of time and attention, but your busy days make it hard to keep up. Why not cross lawn care chores off of your to-do list for good? You can, thanks to Lawn Love. Our independent lawn care professionals know exactly how to get your lawn lush, healthy, and beautiful, year after year. And with simple online access (including our convenient app), it's easy to arrange your lawn care, even when you're out and about. So call Lawn Love today at 361-288-4550, or try out our simple, no-commitment two-minute quote, and turn your lawn into the best scenic view around, easily!